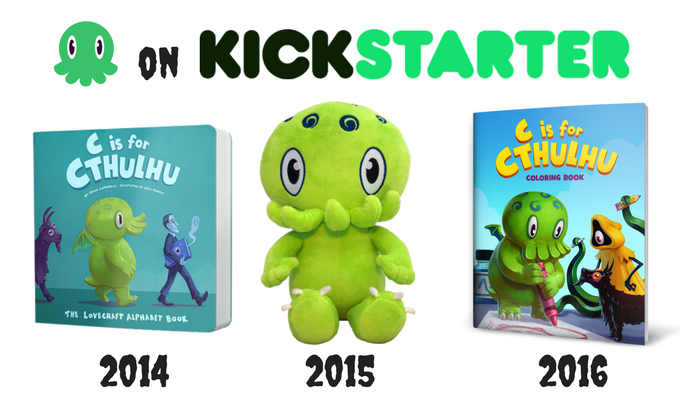 The Kickstarter that raised $21,000 in one day (and has now hit over $50,000), Sweet Dreams Cthulhu is an all-ages premium bedtime board book. 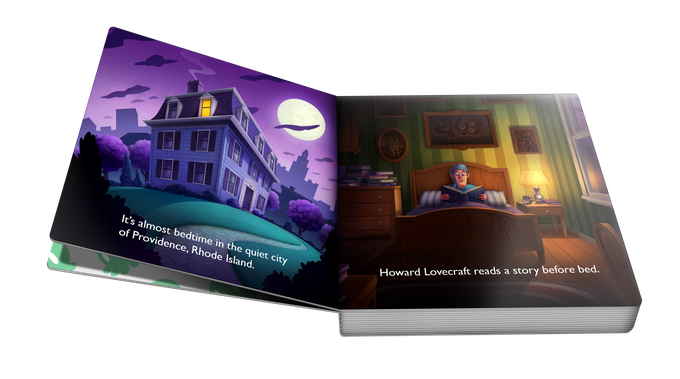 The creators of the book also made C is for Cthulhu: The Lovecraft Alphabet Book, the best reviewed Lovecraft children’s book. The story in Sweet Dreams Cthulhu is about Howard Lovecraft getting woken up by his friend Cthulhu, who is having trouble sleeping because of bad dreams and his fear of the night. Lovecraft talks Cthulhu through his troubles and explains that nighttime isn’t really scary after all. Returning readers will recognize some characters from C is for Cthulhu. The book is a 24-page hardcover with painted illustrations. Sweet Dreams Cthulhu is penned by Eisner Award nominated writer Jason Ciaramella (Joe Hill’s The Cape, Godzilla: Kingdom of Monsters, Magic: The Gathering—Theros). The artwork is done by artist Greg Murphy. The third member of the team is Tyler James, publisher of ComixTribe. 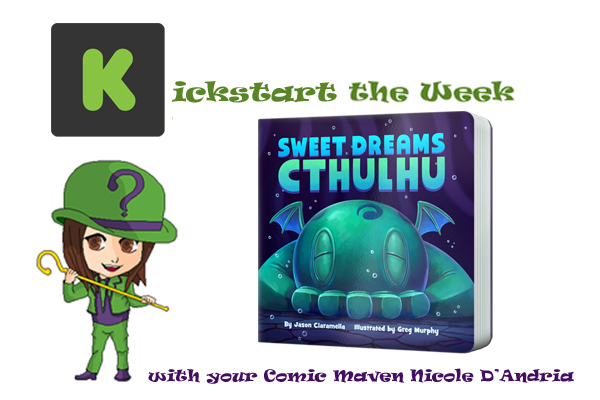 Rewards include a digital deluxe eBook ($10) or hardcover board book ($20) of Sweet Dreams Cthulhu, hardcover copies of both Sweet Dreams Cthulhu and C is for Cthulhu, or the hardcover board book of Sweet Dreams Cthulhu and a C is for Cthulhu Plush Toy (Green). Get all the plushies, pins, stickers, books and more when you pledge money for the collector’s box ($199). Look for details on their Kickstarter page. Me: Why did you decide to take Cthulhu in particular and put him in a children’s book? Jason Ciaramella: I wanted to use a character that was instantly recognizable to Lovecraft and horror fans, so Cthulhu made the most sense. Also, from a design perspective, he was really the best choice for our mascot. It’s also one of my favorite Lovecraft stories. Me: All of your Cthulhu projects have been extremely successful. What are a couple of reasons why you think so many people gravitate towards these books so much? Ciaramella: You know, when my sons were little, I would have loved books like C is for Cthulhu and Sweet Dreams Cthulhu. Something I can relate to, that takes the monotony out of reading rituals. I think a lot of parents feel the same way. It’s a way for fans of the source material to share something they like with their kids, in a more age appropriate way. Me: What tips can you give to aspiring creators trying to make it on Kickstarter? 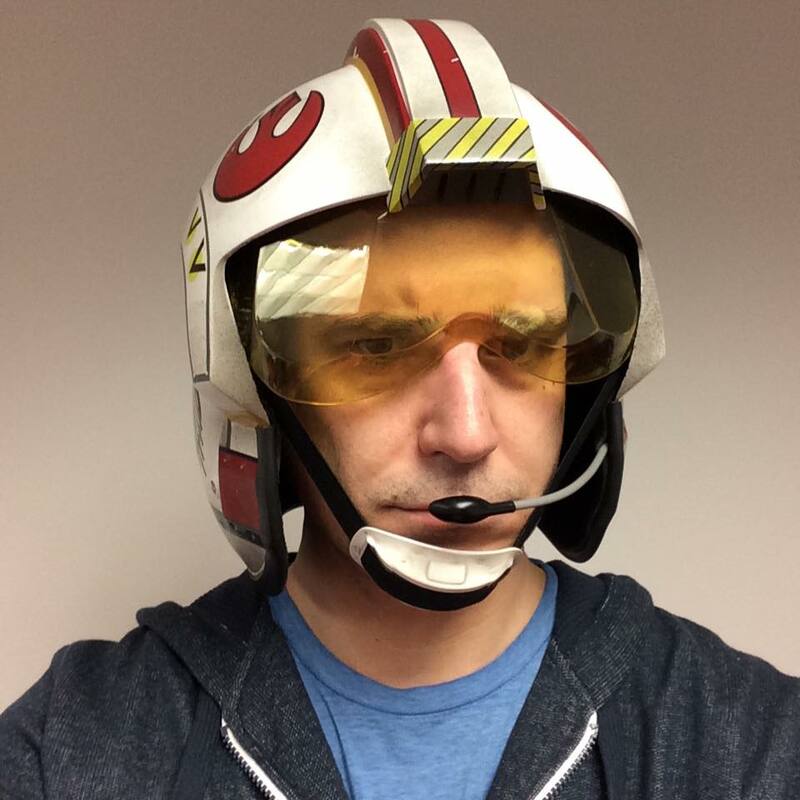 Ciaramella: Yikes! I have no idea, since I don’t really handle much of the business end of things. I’m lucky to have a publisher in Tyler James that has seen a lot of success on Kickstarter, and has done an amazing job steering this ship. So, ah, I guess my advice would be to get yourself a Tyler James. Me: Do you have any other follow-ups planned and can you tell us anything about them? Ciaramella: We’re just cracking the surface and have a lot of projects planned that we’re extremely excited about. One of the things I’d really like to do next is a series of early reader books featuring original stories for our young fans who are starting to grow out of the board books. I think that’s an important next step. Me: If Cthulhu could hang out with any other monster of your choosing, who would it be and what would you have the two of them do together? Ciaramella: It would have to be Godzilla. They’d be best green pals, riding their bikes to the beach on a summer day. Godzilla would have a salami sandwich, and Cthulhu would have tomato and mayo on pumpernickel. Most people don’t know Cthulhu is a vegetarian. Sure, he’ll feast on your sanity, but he has no interest in eating your dirty foot. Me: If you could take another Lovecraft story and turn it into a children's book, which one would it be and why? What would the new children's version be like? 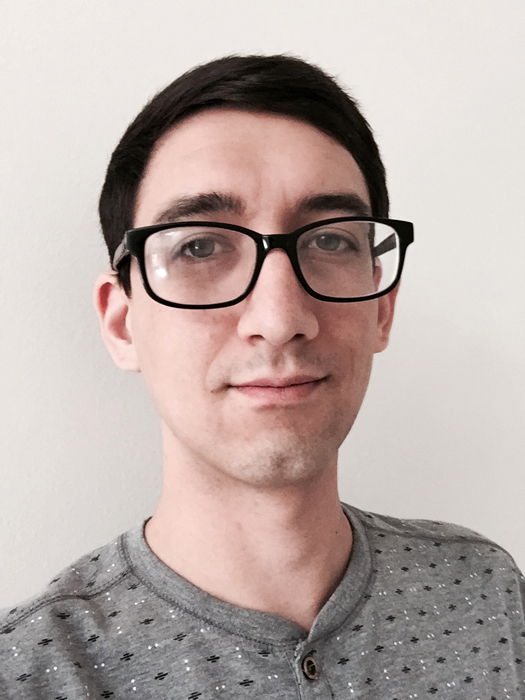 Ciaramella: We’re much more interested in creating original stories featuring our versions of Lovecraft’s characters, but if I had to adapt one I think it would be At the Mountains of Madness. In my version, the explorers would be Howard and Cthulhu, and when they arrived at the city they’d find the Elder Things and Shoggoths having a 70s themed dance party. Howard and Cthulhu would join in, of course, and it would be the weirdest episode of Solid Gold anyone has ever seen. Me: What do you think is the number one reason people should back your Kickstarter? Ciaramella: We care deeply about everything we make, and are dedicated to producing items that ooze quality and passion. Me: What tips can you give to people interested in writing children’s books? Ciaramella: I would say to keep an ear on the tone, and read it out loud often, because the majority of the time that’s how it’s going to be read. It’s a little detail that I think can be easily overlooked. Me: What inspirational words do you have for people in general about writing? Ciaramella: Write what makes you happy and don’t worry about getting published so much. Also, don’t worry what people will think—just empty your brain onto the paper and keep going. My best work happens when I think no one else is looking. Me: How did you get involved with this project? 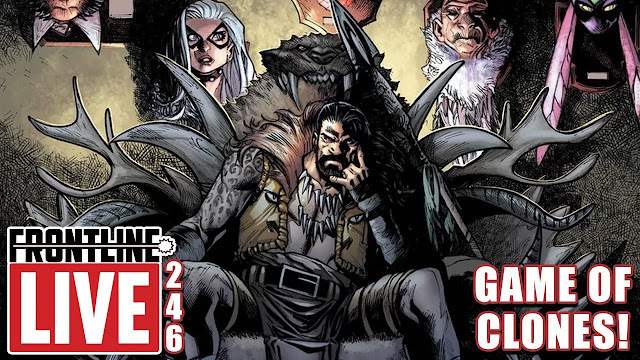 Greg Murphy: A few years back, I was working as an artist at a small software company in Massachusetts, where I met Comixtribe publisher Tyler James. I had done a few small illustration projects for Comixtribe in my off hours, so Tyler was already familiar with my work when (author) Jason approached him with the idea for a Lovecraft-themed children's alphabet book. Jay had the concept all figured out but no one to illustrate it, so Tyler sent me an outline of the project, and asked if I would be interested in coming aboard as the artist. Since I've spent roughly 75% of my life drawing weird monsters, I said yes pretty much immediately. That book was C is for Cthulhu, the success of which launched our C is for Cthulhu series that Sweet Dreams Cthulhu continues. Me: What was your favorite page to draw in Sweet Dream Cthulhu and why is it your favorite? Murphy: Hmmm, that's a tough one...The art in C is for Cthulhu was a big hit with our fans, so I knew my only option for the second book was to try to top it. The goal of really pushing the art in Sweet Dreams made almost every page an exciting challenge, but Page 4 (image attached) was probably the one that still sticks with me the most. It was an intimidating page, because it's the first time Cthulhu is revealed in the book, and I knew it had to be a striking, iconic moment. It was the first real test of the new art style, working out the perfect image to basically set the tone for the rest of the story. I couldn't be happier with the end result! Murphy: Every day, I'm completely blown away by the huge amount of support we receive for the C is for Cthulhu series. 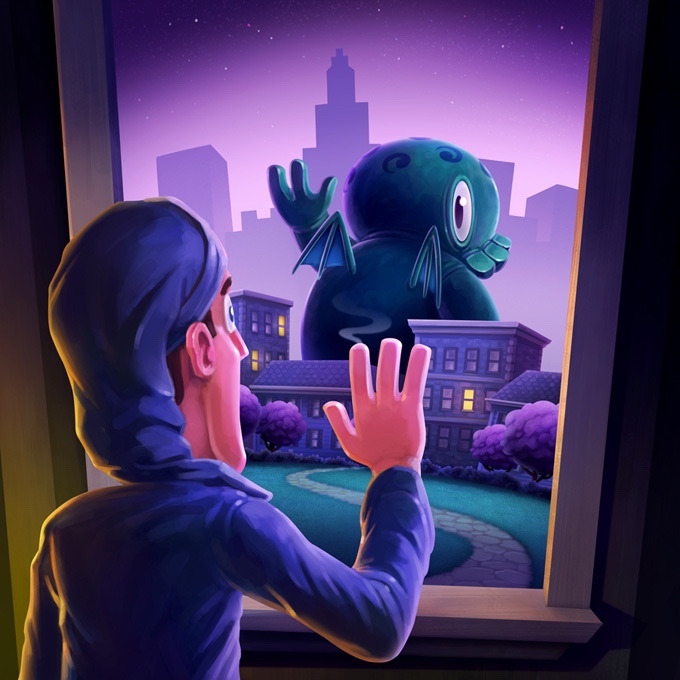 We're only a few days into the campaign for Sweet Dreams Cthulhu, and the enthusiasm and generosity of our fans already has exceeded what I could have imagined when we began this project. I have a few theories of why these books elicit such strong, positive reactions from people. I think there's an inherent curiosity and humor that arises from taking some of Western literature's most bizarre and horrifying tales and twisting them into cute, candy-colored stories for children. Maybe it's almost some sort of cathartic release, these creatures' powers to terrify taken away and inverted, making them look the way we would feel were we to stand in their presence? A more grounded possibility is that we make a very conscious effort to connect with our fans in a way that a lot of other creators don't. 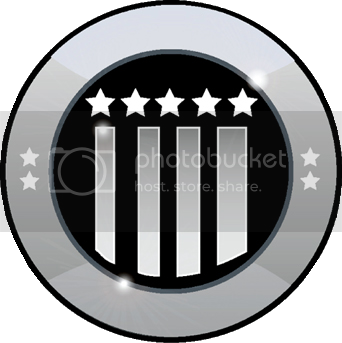 We listen when they have suggestions and ideas of how to improve the series, and we try to be as transparent as possible about every step in our creative and business processes. I think that personal connection and our commitment to quality are why people keep coming back. 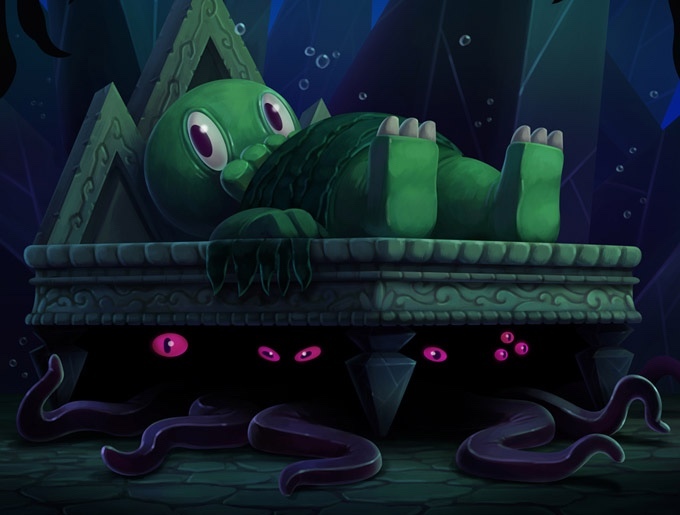 Me: If you could draw Cthulhu hanging out with any other monster of your choosing, who would it be and what would you draw the two of them doing together? Murphy: Easy. 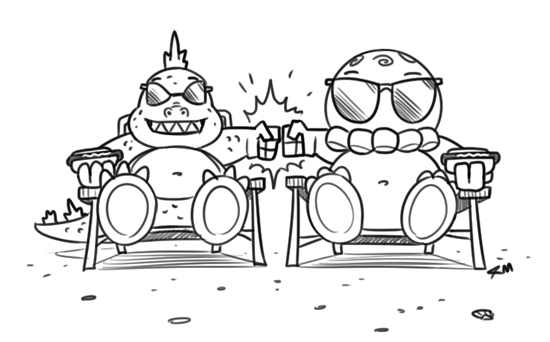 Godzilla, and they'd be eating hotdogs at the beach. Me: If you could take another Lovecraft story and turn it into a children's book, which one would it be and why? What would the new children's version be like art-wise? Murphy: I'd actually be much more interested in illustrating another Jason Ciaramella original, inspired by Lovecraft, rather than a straight adaptation. I think one of the unique things that sets Sweet Dreams Cthulhu apart from the many other books in the Lovecraft-But-It's-For-Kids-Now space, is it's not an adaptation of any of Lovecraft's existing works. Instead, we're using Lovecraft and the Cthulhu Mythos as a bedrock to build our own, very different, stories upon. There's something satisfying about using creatures Lovecraft intended as living nightmares to bring comfort and quiet to kids who may harbor very real fears of monsters and all such things. I'm not sure H.P. would approve, and I'm certain some of his more curmudgeonly fans also do not, but for me it's the purest way for us to invoke the imagination of Lovecraft without bringing along some of his ickier traits for the ride. As for the art for any future books, I'd love to make them even cuter and cuddlier, but also weirder. It's a tough line to walk, and I'm not sure we've had the right book for those three elements to be in balance exactly the way I'd like yet, but we will! 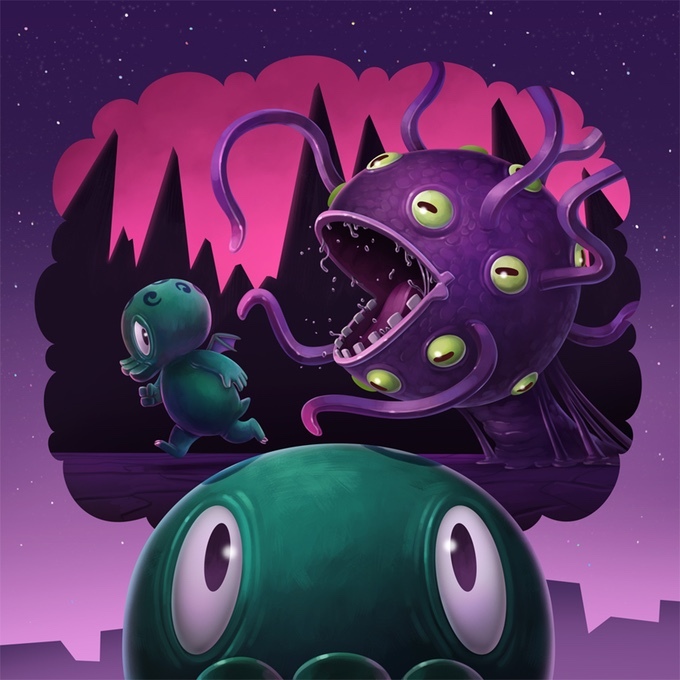 Murphy: I think the number one reason to support Sweet Dreams Cthulhu on Kickstarter is to get to be a part of one of the greatest Lovecraft communities on the internet. 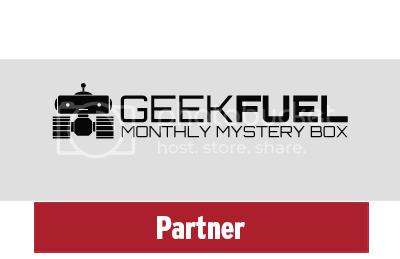 That's not me bragging about our products, that's me in awe of how incredible our fans are. You'd be hard pressed to find a more positive, friendly group of individuals who are just excited to share their love of all things Cthulhu. The fact that you'll also be getting a beautiful, premium quality book to treasure forever if you back us is just a bonus! Me: What inspirational words do you have for aspiring artists? Murphy: Just keep making art. Never stop. That's really the only secret to it. Me: Thanks for taking the time to answer my questions Jason and Greg! If you’re reading this an thinking about pledging money to their Kickstarter, check out the project here.